Our North Texas event was held for the 4th consecutive year at the Grapevine Mills Mall. We had a great turnout despite the fact it poured down rain for the entire day. Our official count was 169 EVs which we consider a victory because of the weather. Roads were closed due to rain near our event and even with all of those issues, we still had our highest EV count to date. We would have surely hit over 200 cars if the weather held off. Several OEMs were present during our event with booth space including Chevrolet, Nissan, Mitsubishi, Toyota, and Jaguar (with a prototype I-Pace). Local non-profits were in attendance educating attendees about solar, green energy, and recycling. 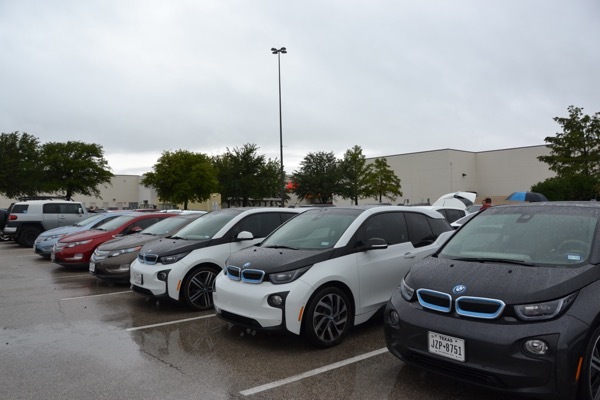 We’re excited to be back at Grapevine Mills for our annual Drive Electric Week event. We’ve set a Texas record the last three years and will make an attempt at our biggest goal yet, 200 cars. With several new vehicles coming to market, we can make it happen! We’re asking all event attendees to register below. Once registered, please visit our website, DriveElectricDFW.org for information about the event. Our event is free to attend so make sure you invite your family, friends, neighbors or anyone who want to experience electric vehicles in a no-pressure environment. There are currently 627 attendees registered. Registered attendees report 5,845,757 electric miles driven.